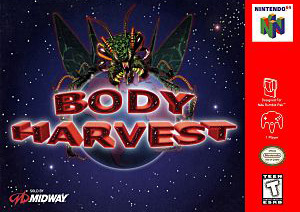 Body Harvest for Nintendo 64 allows you to be Adam Drake, a genetically enhanced marine chosen to go back through time to stop the alien attacks and prevent the invasion. The game covers five gigantic levels spanning more than a century including Greece 1916, Java 1941, America 1966, Siberia 1991, and the Alien Comet 2016. Each time period is defined by a unique set of weapons and vehicles, including planes, tanks, cars, trucks, and bikes. There are over 70 different types of aliens to overcome and more than 60 vehicles to take pilot.